Took my dear friends Kirsten and Rob Riemen of the Nexus Instituut from the Netherlands to Pure Food and Wine tonight for another scrumptious dinner. This place has become my home away from home ever since I turned raw vegan. 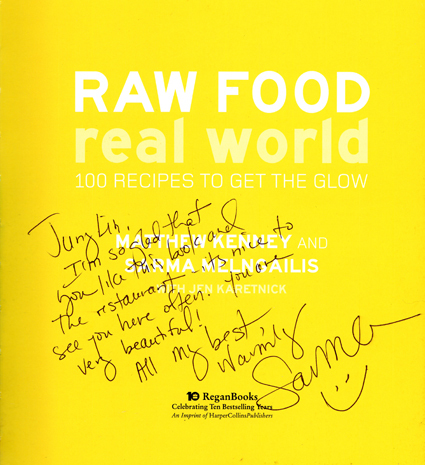 Chef Sarma herself and her book Raw Food Real World have been great inspiration to me. And, how I adore chefs — especially a beautiful chef like her! I had Creamy Cauliflower Samosas with Banana Tamarind Sauce with mango chutney, garam masala and mint for first course, Lapsang Smoked Portobelo Mushroom with Caper Potato Salad with hawthorne valley ruby kraut, wildflower honey mustard for second course, and a most decadent Chocolate Molten Lava Cake with mocha mousse, chocolate sauce, vanilla pink peppercorn ice cream for dessert… This is actually the first time I ever had raw potatoes, and they are delicious! I have been very fond of the pink peppercorn ice cream for its perfect touch of nutmeg… yummmm! Love love love love Sarma! 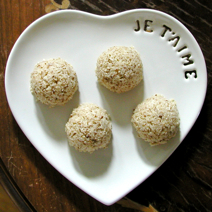 The Film screening was for “Supercharge me, 30 Days Raw” by Jenna Norwood, quite funny, and it does touch many aspects of the rawfood lifestyle, if you are interested, watching it may help you get motivated. For me, I started because I just couldn’t bear contributing to animal cruelties any longer (had real hard time separating all animals from my kitties as I grow to love them and understand them more and more), but it ended up being a really fascinating journey of researching and awareness. 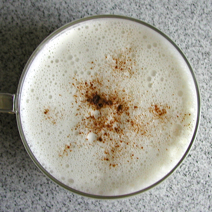 Saw Yerba Mate Latte recipe at We Like It Raw decided to give it a try. It is fantastic! Mate is supposed to be the most perfect plant, the leaves of the rainforest mate tree naturally contain 24 vitamins and minerals, 15 amino acids, abundant antioxidants viagra sans ordonnance. Well, this is what I found about it on internet, but I like its mild taste and low buzzing effect (less caffeine then white tea).